Is it a laptop? Is it a tablet? 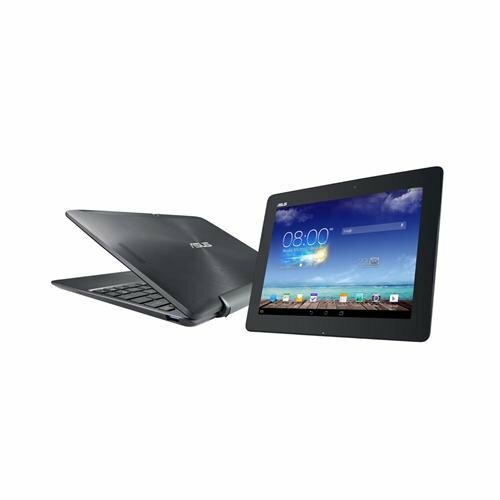 The Asus Transformer Pad TF701 straddles the divide between the two forms, marrying together an Android tablet and keyboard dock into the one affordable device. The TF701’s 10.1-inch screen delivers a whopping 2,560 x 1,600 pixel resolution (229ppi) which puts it right up there among the highest-resolution devices on the market. Put it this way - the TF701 is higher resolution than the iPad Air and is a similar price even with the dock included. Has Asus made the ultimate Android alternative and does the big resolution bring results just as noteworthy? There is a balance about what to expect from the Asus FT701. At the core it’s an Android tablet, so if you’re expecting a typical Windows laptop experience when that keyboard is locked on then you might not get that sensation from this device. However, Asus has put in some subtle reworkings of the stock Android experience, with Asus Widgets - the ability to open up secondary applications in smaller windows - adding to that laptop-like experience. We found it useful for taking notes while watching a livestream, for example. While Android might not appear to be the most immediate laptop sort of experience, it's got the majority of work-related tasks covered. Particularly with a keyboard; there’s obvious logic in having key-based input for Android. Load up the pre-installed Polaris Office, or download Office 365 and that’s all your basic word processing covered. But as a tablet device Asus offers no on-the-go connectivity - it’s Wi-Fi only. No 3G, no 4G. Nada. The standout feature of the Transformer Pad TF701 is its screen. When we saw the earlier Transformer Pad Infinity we were impressed by its better-than-HD resolution. In the TF701 that’s escalated to a 2560 x 1600 resolution which is, in short, amazing. And not just because it's a high number - it's genuinely good. Screens are far from just being about number of pixels crammed into a given space. Colour reproduction, viewing angle, brightness and the like all build up to make for the fuller experience. Again the TF701 wins in these departments too. The IPS panel looks great from a variety of angles and it’s bright enough to withstand any conditions we used it in. We’ve found it comfortable enough for lap-based use, on a desk, and have never had to crane our necks to get a decent angle on to the screen. Although, saying that, this is the UK in the gloomy winter - so we’ve not been able to expose the screen to proper sunlight in outdoor conditions. And the screen’s glossy finish is overly reflective even in gloomy overcast situations. When it comes to multimedia the Transformer Pad is no slouch. We’ve watched a variety of 1080p files that have played back nice and smoothly. The Nvidia Tegra4 quad-core 1.9Ghz processor sees to that, and gaming is no problem either - although on a 10.1-inch screen it can feel a little cumbersome given the 585g tablet-only weight. Had enough of whatever is happening on screen? Swipe on the screen just like you would with any other Android device. Found here in its v4.3 Jelly Bean guise - we had to update to get it onto this version from 4.2.2 - the operating system is easy to figure out whether you're an Android ace or not. The only issue with a touchscreen, particularly a glossy one, are the fingerprints that seem to stick to the panel. So far so good, but the build quality of a device is of key importance. And it’s here that the TF701 is a little bit mixed because it hasn’t really adapted its design concept over the previous few iterations of product. Some aspects are top notch, others passable but less exciting. The tablet part of the build is a little weighty and the bezel is to excess, for example. Obviously having a black-out bezel area is essential for holding the tablet and not activating touch-based commands, but other devices on the market deliver it with greater style without compromising controls. The weight of the device comes in part from the brushed-aluminium shell that covers both he rear of the tablet and the base of the keyboard. It’s got a textured finish and the way it catches various light gives it a silvery blur-purple appearance some of the time. It’s rather good looking. The only time the metal finish falls away is in place of plastic for the top lip of the tablet, which is where the included camera is housed. The keyboard dock is also plastic except for the underside. Compared to the Transformer Pad Infinity we think Asus has managed to shave a lot of the price away without cutting into the FT701's build quality too much. It might not have the all-round refinement of something like an iPad Air, but we do think this is a strong Android offering on both the aesthetic and performance fronts. When it comes to ports the TF701 offers plenty, but spreads it out among the two parts of the device. The tablet doesn't contain the USB port, for example, and this makes it feel less Microsoft Surface than some might like. There’s also just the one USB 3.0 slot - we’d have liked a second one on the opposite side to plug in multiple peripherals as required - and the full-size SD card slot is also bound to the keyboard dock. Both useful to have, but it leaves the tablet more sparse in its connections. Not that the tablet element is entirely void of connections by any means. There’s a microSD port which is great for loading with media to extend the 32GB or 64GB eMMC drive on board - the larger one just adds a little more to the asking price - while a 3.5mm headphone jack for and a microHDMI out complete the package. Charging is handled via a proprietary fitting on the keyboard base that you’ll need to plug into the wall to juice the tablet up. With the tablet attached to the dock both elements charge from the one cable, but not particularly fast. We also had some issues with charging dipping in and out some of the time, while leaving the laptop in standby didn’t seem particularly effective at maintaining battery life in our review unit. However, the total battery life is very good. From full the tablet claims 13-hours, the dock 4-hours, totalling an apparent 17-hours of life. We didn’t get that much out of it given our mixture of use, and with the screen dimmed the reflective qualities were a bit too annoying. But a solid day’s work was no problem and that's one of the benefits of Android. Double-digit battery life? We’ll definitely take that. The 10.1-inch tablet is only 15g heavier than the 570g keyboard dock, delivering a combined weight of 1.16kgs all in. We were able to fit the unit into a satchel bag without problems and didn't find the weight prohibitive at all. This near-equal weight of both component parts means the TF701 can stand up like a laptop, and it just about rests on a lap without too much trouble - although it does feel slightly top-heavy so it’s fairly easy for it to topple over backwards. Not a problem when fingers are rested on the keys, though. The typing experience is fairly good given the available surface area. We’re used to typing on a 13-inch or 15-inch device, so having keys closer together and, in most cases, shrunken down in this 10-inch scale chiclet keyboard made for an initially tricky transition. But once we were used to it, those plastic keys provided enough feedback for assured typing and we were comfortable knocking out stacks of words with only the odd typo. Even later down the line we had fully adapted and it felt much like using a mini laptop. The trackpad isn't as happy a story. The single unit has left and right clicks but it's the small scale that's hard to get over. It’s smooth to the touch and did the job, although we found the default speed to excess and the size always felt like an unavoidable shortcoming. Of course this is an Android device and the touchscreen interface might mean you utilise the trackpad less than you otherwise would. Great screen resolution, solid battery life, and all-round sturdy build quality given the price point are obvious plus points. There’s a lot to be happy about. Whether you choose to use it as a tablet-only device - and it is lighter than the original iPad - or a sort-of laptop replacement with the keyboard dock, there’s a lot of life to get from the TF701. This is Android taking on Windows 8.1 RT Surface 2 territory and, for our tastes, winning. We’ve found the keyboard-docked Android device to work a treat for the most part thanks to 1.9Ghz Tegra 4 that is powerful enough to deliver for those daily needs. But it’s not a device that will suit all. The reflective screen, excess bezel and lack of connectivity are minor quibbles to counteract the positives, while the keyboard dock and small trackpad doesn’t quite add up to a laptop replacement either. But if the Asus has caught your attention then we’re yet to see a dual-function Android device that can better it. It’s really rather good.